Bali not only offers natural scenery of the beach or the mountains, but the existence of a place of worship of Hinduism such as the Taman Ayun temple is also used as a tourist destination, because this temple has historical value and presents beauty, which can fascinate all visitors from all over the world, feel happy and fascinated once your visit at Taman Ayun Temple. Please book our Bali best Driver tour if you want visit this beautiful Temple. The island of Bali is identical to the island of Thousand Temples, there are many majestic temples, appearing with beauty, although a number of places of worship are used as tourist destinations such as Besakih Mother Temple, Uluwatu, Lempuyang, Tirta Empul, Tanah Lot, Batu Karu and including Taman Ayun Temple , but its main function remains as a place of worship and purity is always maintained by the Hindhu Balinese. Taman Ayun Temple is located in Mengwi village, District of Mengwi, Badung Regency – Bali. Temple which is also one of the famous tourist attractions in Bali, is still located in one Regency with a number of other popular tourist objects such as Kuta beach, Tanjung Benoa, Uluwatu, Jimbaran, Dreamland, Sangeh forest monkey and many other famous tourist attraction can see in Badung Regency. Taman Ayun Temple was built by King Mengwi, I Gusti Agung Putu, in 1634 AD (Icaka 1556), built by the Royal Family, it was inherited as a Mother’s temple to the royal family. Badung Regency is indeed rich in tourist attractions, which is why the district is the highest contributor to regional income in the tourism industry in Bali. The existence of the Taman Temple is a complement to the list of tourist attractions in this Badung Regency. Taman Ayun Temple derived from the words Taman means Garden and Ayun means Beautiful, Its a place of worship located in a beautiful garden area, its charm makes visitors feel comfortable see the gardens neatly arranged, surrounded by fish ponds, so that it seems to be located on a lake. The area of ​​the park follows the temple around 4 hectares, enough to give you experience when visiting this tourist attraction in Bali. Taman Ayun Temple is laid out so well, cleanliness is maintained, gardens are neatly arranged. Consisting of 3 courtyards and increasingly into the courtyard’s higher position. The first yard, left side of you hand, you can see is the beauty of the park with a yard overgrown with green grass and small hall as relaxed spot while see the ponds and on the right hand, we have bill Hall Meeting that was used to function as cockfighting or tabuh rah in a series of religious ceremonies and also use as the preparation during the Temple Festival. In the second courtyard there is a towering bale of kulkul on the left side, on the east there is a group of small temples, and the western part outside the temple barrier, there is an art gallery that displays a collection of several paintings including a Barong mask. And next is the third courtyard, the highest and most sanctified location, is the main courtyard. There are a number of Meru buildings towering like a palm-roofed pagoda, this part is not open for the public or visitiot, its only open for worshipping and ceremony, but we can walk along the path outside of the wall and see how beautiful the Temple. 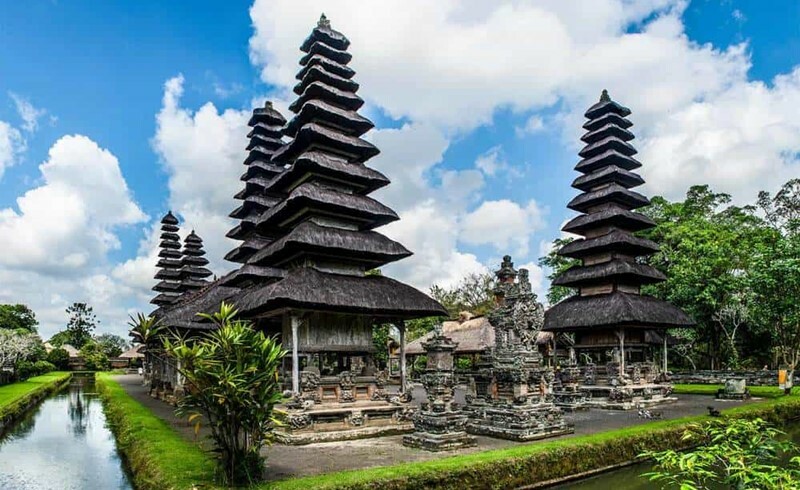 The exotic Taman Ayun Temple indeed makes a lot of tourists interested in arranging a tour plan in Bali by entering this temple attraction as a mandatory place to visit. 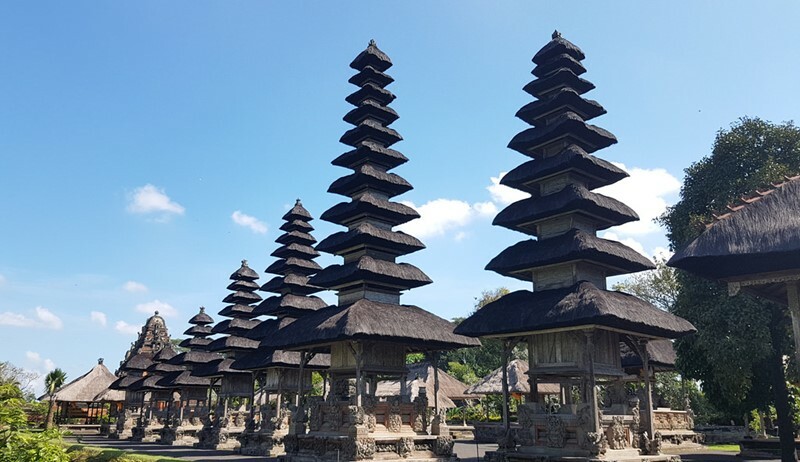 In addition, tourist travel agents prefer to enter Taman Ayun temple in their tour packages, because it is strategically located on one tour route towards Bedugul, Tanah Lot and Alas kedaton. How far Taman Ayun from Bali Airport? 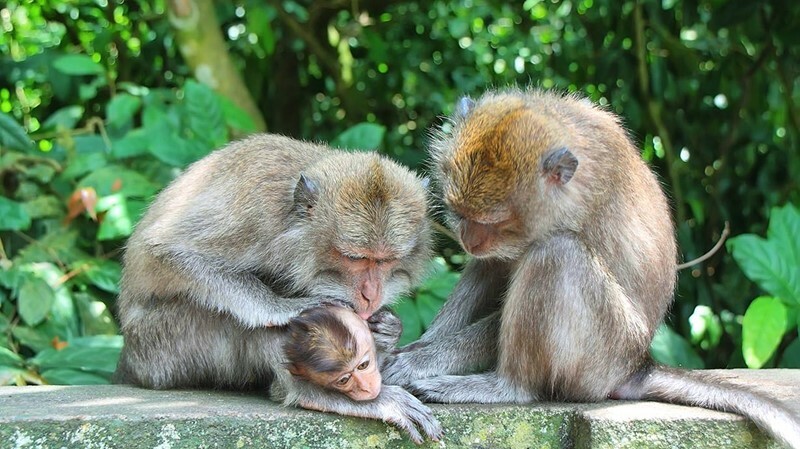 From the airport it takes about 1-1,5 hour drive, the best choice for going to Taman Ayun Temple can be by joining Bedugul Tour where the first destination is to visit Taman Ayun Temple, then head towards Bedugul, to Alas Kedaton monkey forest and finally to Tanah Lot attractions . Other than by joining a tour package you may take our BalicabDriver services to go around. What else we can see after and before visiting Taman Ayun Temple ? Ulun Dhanu Bedugul Lake Temple.